Small children are running and playing among huts in the village of Mzama in Zambia. One little girl’s t-shirt proclaims, “Captain Adorable.” They are all pictures of health. But this belies a disturbing statistic. 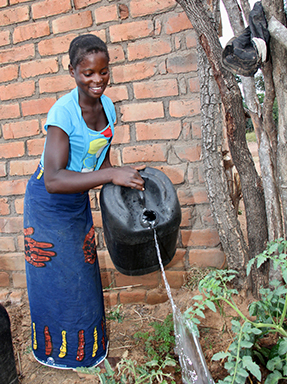 A 2013 study showed that almost half of the children in Eastern Province in Zambia had stunted growth. Stunting and related poor health indicators are due mainly to poor diet, of both mother and child. The study showed that stunting was particularly prevalent in the Petakue area that includes the village of Mzama. The study also showed that the diets of 37 percent of children from Eastern Province lack iron-rich foods. The standard diet of nearly 15 percent of the children includes less than four food groups. “Good nutrition is vital in the first 1,000 days of a child’s life,” says Margaret Mwenya, who manages the project for CRS. That first 1,000 days includes pregnancy, so a good diet for mothers is crucial too. To tackle stunting in this region of Zambia, families are now learning just how vital their child’s first 1,000 days are to their development and growth. The goal of FANSER, short for Food and Nutrition Security Enhanced Resilience, is to reach 12,000 households to teach parents better nutrition and hygiene practices that will improve their baby’s health and development and, most importantly, eliminate hunger and malnutrition. Mary Phiri, a mother from Mzama, speaks about her experience with FANSER and how it has helped her and her children. One of the classes taught Mary how to create and tend a backyard garden, of which she is very proud. Her vegetable patch allows Mary to provide highly nutritious produce year-round. She shows off her tasty looking tomatoes, carrots and spinach. Mary attributes the growth of her children to the FANSER project and the knowledge she’s gained, which goes further than gardening. She’s learned about healthy food groups, safe food handling, and good hygiene practices. “It’s important to educate families, and provide the tools and knowledge necessary to help prevent child malnutrition,” says Margaret. 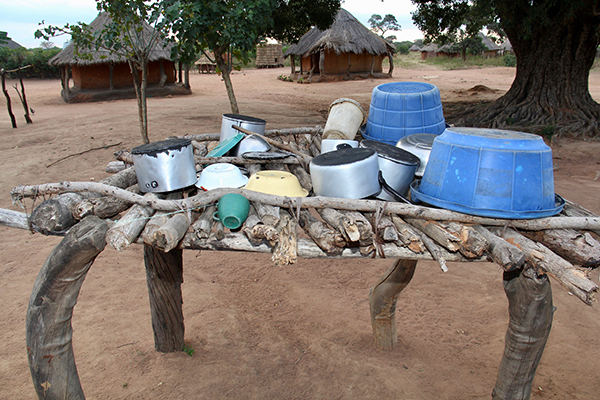 Families are taught 18 lessons, including farming techniques and safe food storage. Special emphasis is placed on the main food groups and how often they should be consumed by baby, and mother during pregnancy and while nursing. If mom isn’t consuming enough of the right foods, her baby can face stunting even before birth. Another critical lesson in the project is hygiene, which can impact nutrition in sometimes surprising ways. “I had no idea my baby could get sick if my cooking supplies didn’t dry properly,” says Mary. Families are taught drying techniques for their cooking utensils and how to build their own drying rack. They are also taught about proper hand washing and food handling. These lessons are important to prevent illnesses that can cause the child to lose vital nutrition. Teaching these lessons can be a challenge because of language barriers, so the use of picture books and radio broadcasts are important. To reach 12,000 households, a care group structure was adopted. This relies on volunteers learning all the health and nutrition lessons from expert health promoters. The volunteers in turn go out into the villages to pass on the wisdom to mothers like Mary. The volunteers are proud of their work and know how important it is for their communities. Their bright blue t-shirts proclaim the slogan “eat right, be bright.” They use song and dance to make the lessons fun and make the class more like a party. Wisely, they understand that this not only boosts attendance, but rhymes and rhythms help make a lesson stick in the same way a mnemonic works. To illustrate the success of FANSER, CRS and the Zambia Ministry of Health use growth charts to track the growth rates of children in the project. From the visit with Mary and her children, it’s obvious the project is working. This project is funded and implemented by Catholic Relief Services, Caritas Chipata and German development agency, GIZ.